Festival camping is a blast, especially when you go prepared & have everything without going too far overkill with non-essentials. 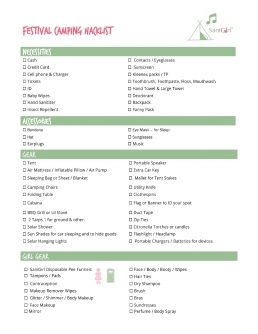 Our Music Festival Camping Checklist below gives you the: Necessities, Accessories, Gear, Girl Gear, Food & Drink, Health, Fun, and Clothes & Shoes list. It’s what you need to prepare for festival camping at its finest! Take the checklist with you to shop, pack, and get ready to go. Snap a screen shot or print it out… but first, here area few more festival camping tips. Check the Festival Website for the Camping Rules for items you can and can’t take. Yes, you may want to grill out, set up tiki torches, or think you’re going to be able to camp next to your car, but every festival has their own rules and what goes for one does not go for all. Once you find out what you can’t take, cross it off the list. Review the weather forecast and average temps and rainfall for where you are going. Even if you are camping in the USA in the Summer, nighttime temps can swing 30°F at some festivals. So know what to expect and take the right gear for day and night. Tweak your list for add-ons. If your festival has Yoga or other classes or contests you’re in to – be sure to add that gear to the list. Also, if you are combining your festival camping with extra days on the front or back end to tour around, pack those items separately. You will be such a Happy Camper if you take a few minutes up front to find out the key information before hitting the road. A weekend of music & camping ... A Lifetime of MEMORIES...This is Living! Find out what food and drink is available there, at what times, and how far from your site. Sometimes Food Trucks are only in main areas and not serving what you want when you want it. So, I say always take breakfast, snacks, drinks, and take as much water as you can – and make sure your friends do too! Go for small packs and travel sizes wherever you can, or repack from larger containers into smaller ones, or Ziplocs. Ziploc bags are great for keeping items grouped together, keeps any leaks contained, critters out, and makes things easier to find while camping. Whether you like them or not, they are great for camping at music festivals. Just wear that fanny pack all the time with your valuables and essentials like: cash, ID & credit card, cell, small charger, car key, wipes, pee funnels, gum, and your lil’ misc. items. SaniGirl sanitary pee funnels give women and girls total peace of mind on the go. It is #1 personal care item to take to music festivals, camping, portapotties, no potties, traveling and more… Just stand at ease. No more germs, squatting, dirty clothes, backsplash, or worry about unsanitary & unwanted exposure. Clean. Compact. Disposable. Easy to use. Eco-Friendly.